WOODLAWN is more than a movie. A true story about people changed by love and devotion to Jesus. It’s time for that to happen again. 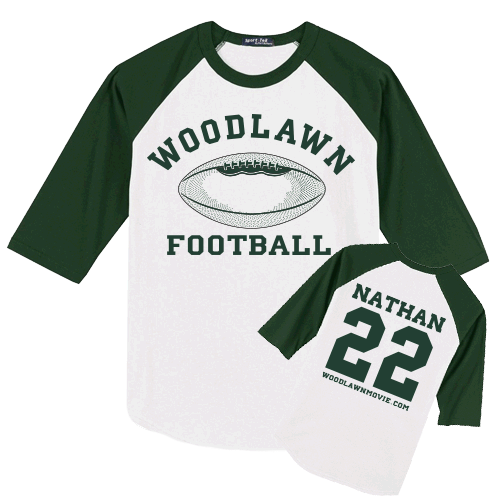 Browse these official Woodlawn products and church resources to help you make the most of the story and its message. One Hope. One Truth. One Way. It’s time to be One. This kit is everything you will need to plan a six-week teaching series around the concepts presented in the ONE Small Group Study. It includes six sermon transcripts, video clips from Woodlawn to accompany sermons, digital art files to help you get the word out about your sermon series, and more. With teaching by Pastors Dave Stone and Tony Evans, ONE prepares your heart to experience and embrace a move of God. The ONE Small Group Study includes: six video episodes on DVD, an easy-to-follow Leader’s Guide for facilitating a small group gathering, and one copy of the ONE Journal for the study. The ONE Journal is a companion to the ONE Small Group Study. It provides daily, personal devotions on the topics of unity and revival found in the 6-week study. Start a revival by making the most of Woodlawn at your church! INCLUDES OVER $80 OF BONUS MATERIAL: This kit includes one copy of ONE (The Woodlawn Study) Small Group Study, Journal, and Pastor's Kit. These resources provide you with 6-weeks of content to use as a follow-up to your movie event! With teaching from Caleb Castille (who plays Tony Nathan in Woodlawn), the ONE Student Study speaks to teens about uniting together. It includes: four video episodes on DVD, an easy-to-follow Leader’s Guide for facilitating a small group gathering, and one copy of the ONE Student Journal for the study. The ONE Student Journal is a companion to the ONE Student Study. It provides daily, personal devotions on the topics of unity and revival found in the 4-week study. God has a journey planned for each of us. During our quest it can sometimes feel like we've been sent into battle without any training. This guide will arm you with 15 keys to help you unlock victories in your everyday life. Along the way, you'll learn how to overcome enemies like regret, doubt, and confusion with the weapons of wisdom, faith, and purpose. This riveting true story of courage, strength, and football at the height of racial tension in Birmingham, Alabama, inspired the motion picture Woodlawn, and tells the story of Coach Tandy Gerelds, his running back Tony Nathan, and a high school football game that healed a city. This devotional provides a 40-day pilgrimage toward renewal and transformation through faith in Jesus Christ. Follow the inspiring story of Touchdown Tony Nathan and the Woodlawn team who changed a city, while looking into your own heart for a fresh start and a new outlook of hope for a brighter day. In the movie tie-in to the October 2015 film, Woodlawn, Tony Nathan (the central character of the film) shares his experiences as an African American running back on a mostly white team in 1970s Birmingham, Alabama. His courage and superb ability helped heal a city and propelled him to a successful football career as both a player and coach in the NFL.